As of this morning before today’s polls update, we project Obama victories in Virginia (4.4%), New Hampshire (3.4%), Ohio (2.4%), Florida (2.4%), and Nevada (2.1%), with Indiana a tie. 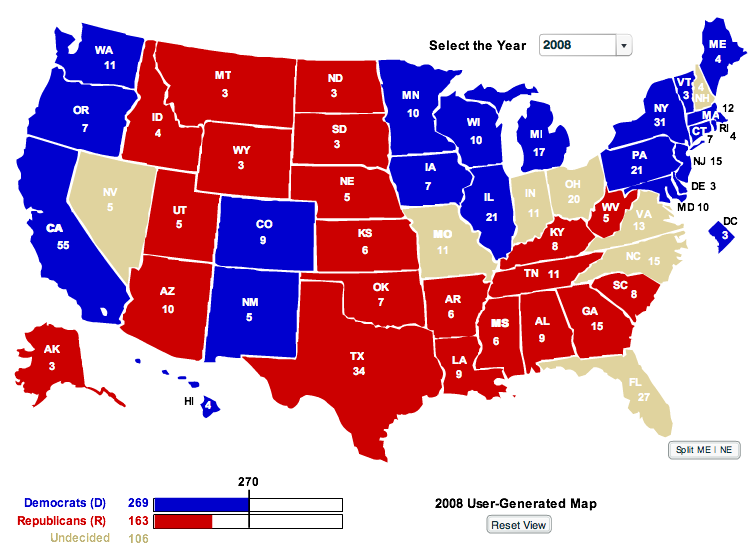 Give all these states to McCain, it’s 269-269 and an Obama presidency. 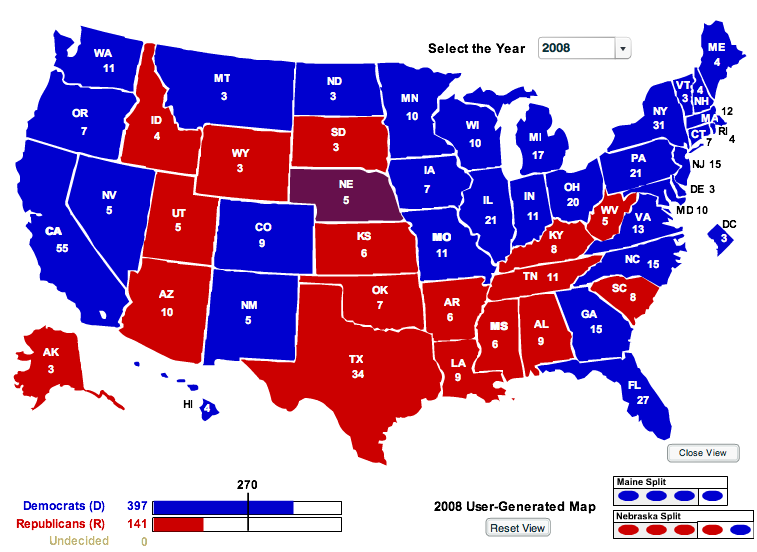 Allocated by lead, it’s Obama 338, McCain 189, 11 tossup. McCain also projects precarious wins in North Carolina (0.1%) and Missouri (0.4%). This does not include ground game, which is about the effectiveness of each side turning out voters who are reporting their presidential preferences over the phone to pollsters. Nor do all pollsters effectively capture the cellphone effect. Don’t get overconfident, get to work. 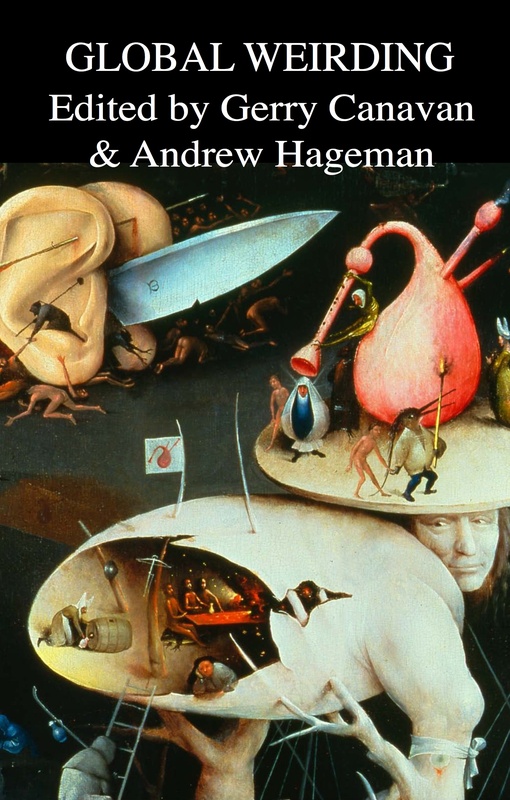 The host of PBS'”Washington Week” and senior correspondent on “The NewsHour” said she did not tell the Commission on Presidential Debates about the book. The commission had no immediate comment when contacted by The Associated Press. A spokeswoman for John McCain’s campaign did not immediately return phone and e-mail messages. There should have been an explicit conversation about this between Ifill and the Commission and another between Ifill, the Commission, and the campaigns; if that didn’t happen because Ifill didn’t disclose the book, that looks to me like a pretty serious breach of journalistic ethics. Of course, it’s the day of the debate, probably too late to replace her, so at this point the alleged conflict reduces to little more than a bid to work the refs and a preemptive excuse for Palin’s failures. Like the McCain of yesterday, I have confidence she’ll be fair, but it’s really too bad that she handed the Republicans such a nice talking point. * There’s lots of speculation that McCain’s last ace in the hole is Rev. Wright. Chuck Todd says it’s too little, too late, and I tend to agree. * Kos had a good post last night about McCain’s strategic dilemma, the fact that any attempt to play offense in the battlegrounds could result in surprise (and devastating) losses in places like Indiana and North Carolina. North Carolina in particular is an interesting case—another poll (Rasmussen’s) put Obama up three here last week, and there’s good reason to think NC is a genuine battleground this year. But any time or money McCain sinks into keeping North Carolina is lost for Ohio and Florida, states he also needs to win. 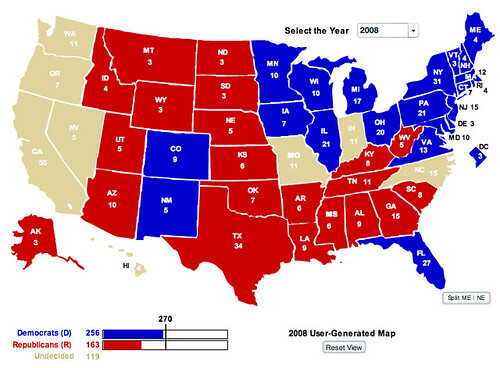 The map at right has Obama at 269, already a likely-if-ugly win for Obama. A loss in any of what’s left will cost McCain the election—he needs the whole slate of swing states just to tie, and right now he’s behind in most. * More swing-state talk from Chuck Todd. Let the record reflect that Barack Obama made the approach to John McCain tonight. As the two shared the Senate floor tonight for the first time since they won their party nominations, Obama stood chatting with Democrats on his side of the aisle, and McCain stood on the Republican side of the aisle. So Obama crossed over into enemy territory. He walked over to where McCain was chatting with Republican Sen. Mel Martinez of Florida and Independent Sen. Joseph I. Lieberman of Connecticut. And he stretched out his arm and offered his hand to McCain. McCain shook it, but with a “go away” look that no one could miss. He tried his best not to even look at Obama. Obama got the message. He shook hands with Martinez and Lieberman — both of whom greeted him more warmly — and quickly beat a retreat back to the Democratic side. Ambinder explains why these sorts of stories (here’s another from the Washington Post) make Republican strategists very nervous. * And Jack Cafferty wants to know how anyone, including McCain, can take Sarah Palin seriously. Steve Benen has a good post up at Washington Monthly about the now-infamous Supreme Court question last night, about how (among other things) it eviscerates the justification for the pro-life position through its concession of a right to privacy. She may muddle through tonight’s debate, she may not, but if she survives as a credible national figure after this cycle she certainly doesn’t deserve to. The Washington Times get excited about 269-269.